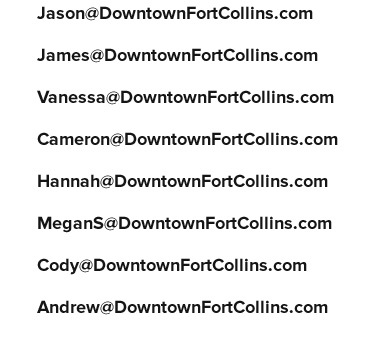 Thank you for your support of Downtown Fort Collins! For specific inquiries, follow the links listed. If you have any other DBA related questions, please fill out the form below. If you’re submitting an event to the DBA calendar, please click the button below. Interested in performing at a 2019 DBA event? Click the button below to submit your band for consideration. To sign up for our community newsletter, please click the button below. If you have other DBA related questions, please fill out the form below.